Elevation1213m�Athe highest peak in the Hakone mountain range. It is said the home-ground of "Kintaro" boy. 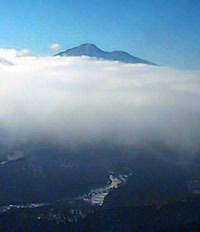 With various seasonal scenes, hikers like to visit there. At the top, the famous "Kintoki-musume" will welcome you and serve you Japanese tea. Take the "Izu-hakone-tetsuto" Daiyu-zan Line from Odawara to Daiyu-zan (25 min.). Then, take a local bus to "Ashigara-man-youkouen"(30 min.) From there, about 1.5 hours walk to the top.